Chloe isn't really a doll sort of girl, shes not really into 'playing' with toys in a traditional sort of way, she has far more of a creative flair. In the years gone by she has asked for Barbie, Monster High and Bratz dolls and I have brought her various ones when she was younger but they all got left unloved and untouched in a basket under her bed, before being handed down to her cousins. 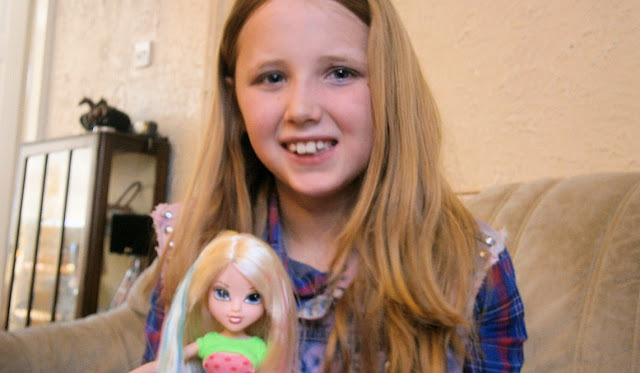 I assumed these style dolls would no longer really appeal to Chloe as she gets older, however when we were sent a Moxie Girlz Magic Hair Studio Doll to review Chloe was over the moon. She instantly recognised the doll and said she had seen TV adverts of Moxie Girlz and had always wanted one (maybe thats the power of TV adverts?) and she seemed impressed with the funky colourful outfit that Avery was wearing. With the big eyes and the long hair these dolls really are very pretty. Moxie girlz motto is 'Be True Be You' and promote a positive attitude in young girls. There are several girlz and lots of different outfits and sets available in the Moxie Girlz range, we were sent the Magic Hair Colour Studio with Avery doll who has long blond hair and looks a fair bit like Chloe! This was a really great set for Chloe, as it gave a productive slant to 'playing' and enabled her to get creative. In the kit there are several hair accessories which enable you to change the hair colour and style of Avery, and the accessories can be used in your own hair too. 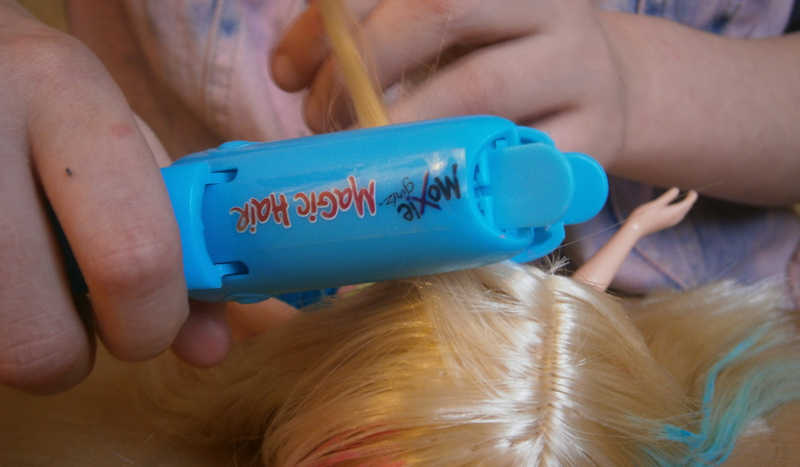 The kit contains a colour streaking tool, with two coloured pastels red and blue, these clip into the tool easily and when you pull the tool through the hair it leaves a coloured streak. It took a few times to get used to the tool and how to get the colour Chloe wanted on the hair but the end result was great. 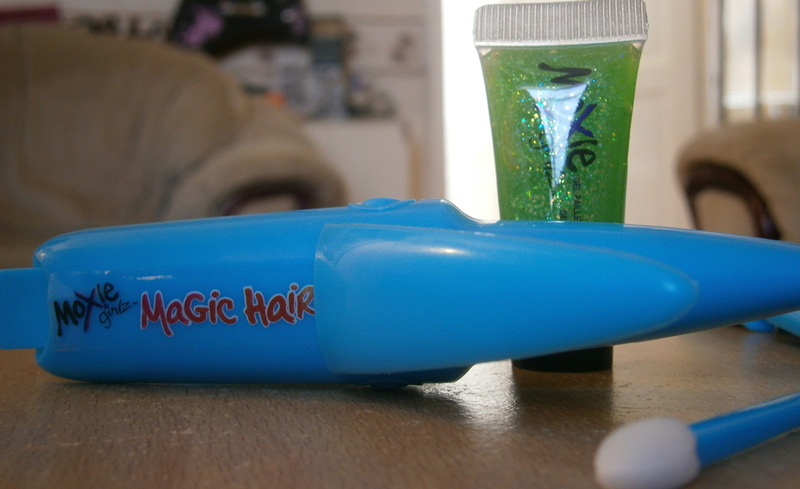 The pastel is a strange sort of texture and makes the hair feel like you have toothpaste in it, but it washes out easily. 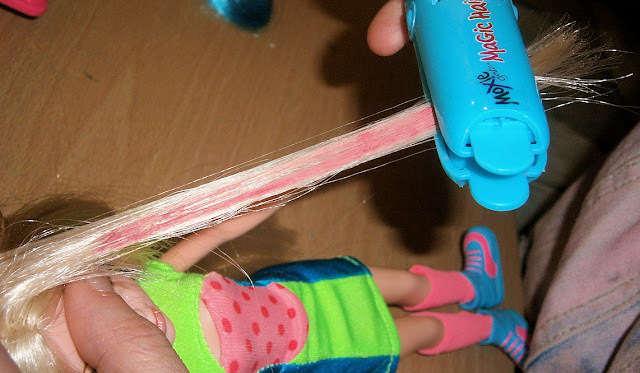 Chloe really enjoyed colouring Averys hair and her own, and has washed out the hair on the doll and re styled it several times. I was really impressed with the set retailing around £19.99 this is a lovely present for young girls even the tweens who you think might be getting too old for Dolls, this really has appeal to them all. Take a look at Chloes Video Review.